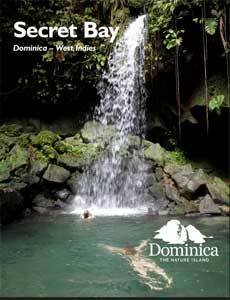 Dominica is an island country in the Lesser Antilles region of the Caribbean Sea. It is known as the “Nature Isle” for its unspoiled, natural beauty and its spectacularly lush and varied flora and fauna. Dominica has many rivers, waterfalls, black and white sand beaches, mountains, forests, and springs, as well as the world’s second largest volcanically heated boiling lake. Compared to many other Caribbean islands, Dominica is sparsely populated, since much of the island is protected by an extensive national park system. It is a paradise for hikers, birdwatchers and nature-lovers, as well as a world-famous destination for scuba divers, snorkelers, and whale-watchers. Because of its unique combination of secluded location and upscale amenities, within a few short years, Secret Bay became known as one of the best boutique hotels in the Caribbean. It has been selected by Travel & Leisure as one of the best new hotels in the world; by Harper’s Bazaar as a top resort; and by CNN as a Secret Island Getaway. TripAdvisor Traveler’s Choice Awards also ranks Secret Bay as a top resort in the following categories: Luxury, Small Hotels, Romance, and Service. In November 2015, Secret Bay was named the Small Caribbean Hotel of the Year by Caribbean Journal. Nassief describes Secret Bay as an “eco-luxury” resort and is passionate about maintaining the property in a sustainable and environmentally-friendly manner. 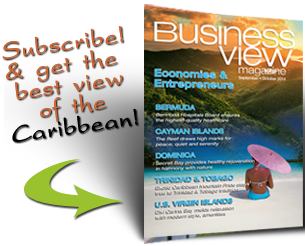 “I think my connection to Dominica and its pristine landscape shaped that passion over many years, and of course shaped the vision for Secret Bay,” he says. “We wanted to build something that afterwards would look like nothing had happened – that would fit into the landscape and would not in any way impact the environment. One of our goals was that as you passed by the property from the sea, you could not tell that it was there. Remember, this was to be our home – the house of our dreams. So with Fruto (award-winning Latin American architect Fruto Vivas), we designed something really beautiful and elegant. That did not change as we scaled it down; we simply created many such homes, just smaller. They were never intended to be hotel rooms, but beautiful homes. So that is where the luxury element emerged. And our vision for preserving the land gave it the ‘eco.’ Eco-luxury was really the natural end result.” Thus, the resort’s four villas and two bungalows have been positioned across the site to ensure privacy and seclusion. All the properties offer glorious views of the Caribbean Sea and rainforest-covered mountains. Part of that special experience can be attributed to Secret Bay’s unique service concept. For example, there is no restaurant at the resort; each bungalow and villa has its own fully equpped kitchen. Guests can create their own meals or they can request a personal cook to deliver up to two meals a day, such as fresh-squeezed mango juice and homemade baked breads for breakfast and just-snagged Mahi-Mahi, crisp salad, and yam pie for dinner. They can also forage for fresh herbs in the gardens or pluck guava, pineapples, and coconuts from the surrounding trees. Other amenities include spa treatments, massages, yoga sessions, a dedicated villa attendant looking after guest needs, and a concierge who helps plan personalized itineraries. Secret Bay’s staff of 30 caters to the resort’s guests, who come primarily from the U.S., followed by Canada, Europe, and the Caribbean, year round. According to Nassief, the majority of them are couples, often celebrating a honeymoon, anniversary, or special occasion. The rest are small families. “They want to be off the beaten path, to get away from it all, to enjoy a quiet and special time, to reconnect with themselves and nature, and to be pampered and taken care of,” he says. “They also want to spend some time being active and adventurous, exploring the wonders of Dominica. 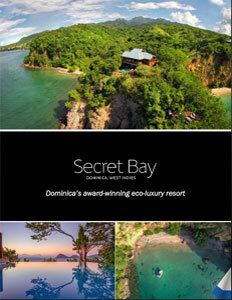 Amazingly, about 80 percent of our guests discover Secret Bay first, and then discover Dominica – often for the first time. Due to the vast landscape and spaciousness, and the amount of natural attractions, you can spend days in Dominica and hardly see other tourists. This is a huge plus in today’s Caribbean,” he adds. With its unique and personalized service that caters to guest preferences and privacy, Secret Bay will undoubtedly continue to be the perfect getaway for a Caribbean honeymoon vacation, a small family escape, or the secluded holiday of a lifetime.